Romy Gill, owner of Romy's Kitchen in Thornbury, Bristol, and one of the few Indian chefs to be awarded an MBE, makes a return to Carousel in Marylebone this January, for 8 dinners between Thursday 5th and Saturday 14th (not Sun on Mon). Tickets are just £37.50 + £2 fees, and you should expect traditional Indian flavours with a contemporary twist. Go! "It's the return of the irrepressible Romy Gill. 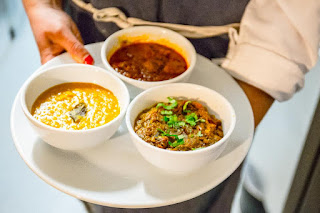 After a whirlwind year, Romy is back with another kaleidoscope of knockout Indian flavours and a list of admirers as long as the Ganges... including Her Majesty The Queen. Romy was awarded an MBE this autumn in recognition for her one-woman mission to educate us island folk in the art of authentic Indian home cooking. This time round, she's adding a contemporary twist to the traditional flavours she does so well with a menu featuring tandoori quail, octopus with tamarind chutney and a to-die-for chai and saffron cheesecake. January can't come soon enough."